By shopping or subscribing through Bardic Web you are helping to keep the site alive and prosperous. BW is entirely member supported and would be unable to provide this wonderful venue if it were not for this support. Please consider contributing to your favorite writing site via the resources below. Our wonderful gift shop offers a myriad of fashionable and practical products sporting the Bardic Web logo or the Fantasy genre’s dragon through Cafe Press. There are t-shirts, tote bags and more available. 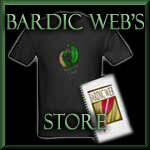 Help support Bardic Web with your purchase and show off your community spirit all at the same time! By buying the books that we create here at Bardic Web, you not only support the creativity of our community, but you help keep our site up and running. Plus, seeing your name in print inside that cover is pretty cool. Become a subscriber of Bardic Web and receive various premium services. Member subscription is the paramount way Bardic Web is funded. Bardic Web remains totally advertisement free due to this generous member support.